Together for over a decade, Sophie Dymoke and her husband Matthew Goode are the perfect examples of a happy couple. 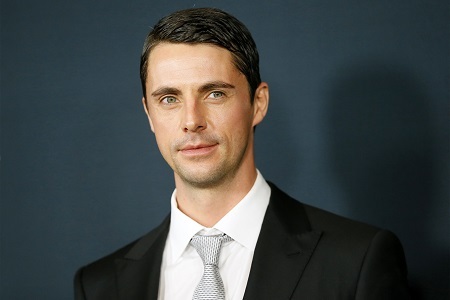 Dymoke, who's a fashion designer is living a blessed married life with loving husband, English actor Matthew Goode who rose to fame from the comedy movie Chasing Liberty in 2004. The pair, unlike other celebrities, has managed to keep their life private but fans are eager to find out all the latest updates going on in their life. So, how is their married life going on? We have all the details about Dymoke and Goode's married life here. Fashion Designer Sophie Dymoke And English Actor Matthew Goode: Are They Happily Married? Dymoke and her husband Goode started dating in 2007 and since then they have been inseparable. The coy couple hasn't disclosed the exact marriage date and wedding location, however, some source claimed that they tied the knot in 2014. Dymoke and Goode are blessed with three children. They welcomed their first child together, a daughter, Matilda Eve Goode in March 2009 and second child, a daughter, Teddie Eleanor Rose Goode was born in September 2013 and later a son, Ralph Goode was born August 2015. Despite living under the radar, Dymoke and Goode have been spotted together frequently in several red carpet events together. Here's a short clip of Matthew and Sophie attending The Imitation Game TIFF Movie Premiere Gala Arrival. Dymoke is a supportive wife and Goode just adores her a lot. In a recent interview with Red Online, Goode expressed how grateful he's to have Dymoke in her life. Here's an image of the lovely pair attending the BAFTAs in the month of February 2015. Simply, they looked like a picture-perfect couple. Well, it's pretty clear that Dymoke and Goode are happily married along with their three children and there are not any rumors of their divorce or affair so far. Chasing Liberty Star Matthew Goode Career Highlights: What Is He Up To Now? The 40-year-old star Goode has a lot on his plate. He is busy in his upcoming projects including TV series Ordeal by Innocence, A Discovery of Witches and The Guernsey Literary and Potato Peel Pie Society. All of these are in post-production. The actor started his acting career from 2002 TV film feature Confessions of an Ugly Stepsister. He then landed his breakthrough role in 2004 movie Chasing Liberty and since then he has been cast in several movies and TV series. Goode was nominated for Teen Choice Awards for the movie. He is known for his performance in Match Point, Brideshead Revisited, Stoker, The Imitation Game, The Good Wife, Downton Abbey, Leap Year, Belle, The Crown and many more. The actor also performed in WGN's production series Roadside Picnic in 2016, the series was canceled later. Goode was born on April 3, 1978, in Exeter, Devon, England, the UK as Matthew William Goode. Her height is 6' 2" (1.88 m) tall. Goode has four siblings. a brother, two half-brothers, and a half-sister. He attended Exeter School, University of Birmingham and London's Webber Douglas Academy of Dramatic Art. He portrayed the role of the love interest of actress Mandy Moore in the 2004 movie Chasing Liberty alongside Jeremy Piven, Caroline Goodall, Mark Harmon, and Annabella Sciorra.